Found 2 file extension associations related to Heroes of Might and Magic VI and 2 file formats developed specifically for use with Heroes of Might and Magic VI. 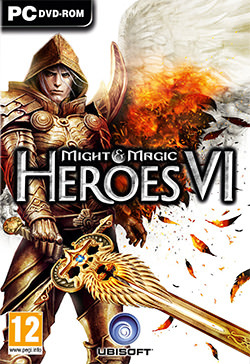 Heroes of Might and Magic VI is the 6th installment of popular turn-based strategy series, developed by Black Hole Entertainment and published by Ubisoft. Released in October 2011. Might & Magic Heroes VI will take place in 564 YSD*, roughly some 400 years before Might & Magic Heroes V, at the time of the second Blood Moon Eclipse, and the Rise of Kha Beleth, the Demon Sovereign. Heroes VI tells the story of the Griffin dynasty, when they were still Dukes of the Holy Empire, and not yet sitting on the Imperial throne (like in Heroes 5 and Clash of Heroes). The Griffin Duchy is east of the Empire, a region that would correspond to the Slavic nations in our own world. At the dynasty’s origins, The Griffin Duke Pavel* was a zealous servant of the Light and a trusted lieutenant of the Falcon Emperor. He met his demise defending his own duchy from a Demon host summoned by the dying wish of a desperate enemy. Pavel’s heroic last stand would ensure the survival of his son, Slava, who was only a boy at the time of these events. Pavel’s sister Sveltana*, who had left her homeland to become a prominent Necromancer in the Seven Cities, was called back to act as regent to Slava and educate him in the ways of the Griffin. Fifteen years and a war have past. Duke Slava of Griffin is now the father of five promising children. These are the main Heroes of the Heroes 6 campaign, and they will lead different factions to battle. If you need more information please contact the developers of Heroes of Might and Magic VI (Black Hole Entertainment), or check out their product website.